Pensacola Discussion Forum » General Discussion » Varsity Game last night! First varsity game last night. My granddaughter played the 3rd quarter for 5 minutes. So happy she got to play. She is the only sophomore on the team. She scored, had 3 rebounds, 2 assists and drove the ball down court several times. So proud of her. She was a starter last year for the JV games. Wow... good for her. I know you're proud. I think i've enjoyed enjoyed watching my kids and relatives play sports more than i enjoyed playing myself. I was too intense... lol. PkrBum wrote: Wow... good for her. I know you're proud. I think i've enjoyed enjoyed watching my kids and relatives play sports more than i enjoyed playing myself. I was too intense... lol. I love it! We probably need our own bleacher section. 14 of us there last night. Update on my granddaughter: she asked to come out at the end of the third-quarter. She developed a chest cold and was having trouble breathing. They wanted her to play the whole fourth-quarter but she said she didn’t feel like it. An exciting time. It will take her awhile to get in game shape on varsity....lots of pressure, but so much fun. I know your plate is full, but I am certain you are not missing games. Thursday night girls varsity in Niceville...we lost but Niceville is a tough team. Boys varsity and JV last night..GB won both games. Our varsity is undefeated. Granddaughter misses her JV playing time. We had a long discussion about making yourself indispensable and sparking and keeping the energy levels high. During the Milton game she played the 3rd quarter and sparked energy. I noticed it right away. Last night she went in during the second quarter with a score of GB down 4-1 pathetic. She sparked energy and elevated her team mates to play her level. The entire gym saw her shine. The score st the end of the second quarter 21 GB to 4. Quite a run. My girl put up 7 points (hit a three) had 4 assists and pulled down more rebounds in the second quarter than the team in the first two quarters. Her teammates told her she earned her varsity spot and they want her as a starter. This MAW was beaming along with my girl. Her coaches were extremely pleased. So proud. After the game, while walking to the car, several of the opposing team members congratulated her. She made her mark and made herself indispensable! Awww... that's so awesome. Good for her. Congrats..!! Wonderful news....hard work, defense, and team work is the art and beauty of basketball. Gulf Breeze takes 4 wins over their rival Catholic High. Both varsity and both JV teams took the win. Granddaughter had an awesome game. Ten rebounds, ten points and several assists. She started and played the whole game until the last 3 minutes due to 4 fouls. Thrilled for her!!!! Nothing would make me happier than to be strong enough to travel and watch a high school girls basketball game......I miss it so much. Enjoy the gift you have been given. I love it...I get so excited. Excited enough that I left the game and got in daughter # 1’s car told daughter #2 what was up. Daughter takes me home and I open the garage ...no car! Yikes I forgot I drove to the game. So busy reliving the game and critiquing the refs and pointing out their inadequacies. How can I remember my car! refs can drive you crazy at the high school level. I know all the refs that work in Gulf Breeze...at the high school and rec center. Really like the majority of them. They always come shake hands with me and know my grandchildren. They have watched my little ones grow up through the sports association and have reffed them for years...basketball and softball. I never learned a thing in victory, but losing gives ample opportunity for kids to grow and improve. When do they play most of their home games, and what time do the varsity games start? The girls would play Saturday and Tuesdays at 8 for our varsity games. In Iowa High School games for the last fifty years you often had more people going to the girls games where girl's basketball has been the thing for fifty years. 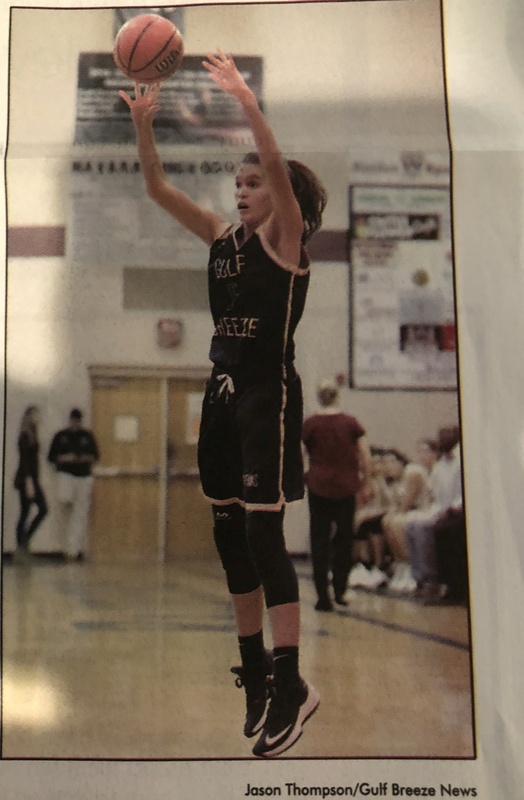 I would give anything to sneak in and watch the Gulf Breeze girls play basketball and will put it in my bucket list if I gain strength and can travel to the super bowl party which for the first time in forty years will be played by my high school friends in Fort Meyer. I loved coaching kids. Coaching, golf, and poker were my passion, and that is why I am having my memorial at the community center where I had so many wonderful memories of kids growing and spreading their wings. The joy of seeing my players as adults is so gratifying, and I am jealous of my wife who as a teacher has about 100 of her former students on facebook......to share these kids lives is just so wonderful. They play during the week. Starts at 6pm. The boys varsity pack in the most spectators. Gulf Breeze has a $6.00 admittance fee. Elementary students and younger are free. The middle and high school kids pay full price. Need a student fee of $1.00. She needs to channel those tears. I did not like crying. I liked angry. Please keep telling us about her games.....it is so much fun. I am going to go to my local high school sometime in the next week and watch a girl's varsity game. My wife and I have talked about going for five years as I like to apprise talent and I am very curious on the local program. live and enjoy youth and family. She is learning. She wanted to be a starter but did not want to offend the seniors. When she doesn't play to potential it upsets her and she feels she let her teammates down. The seniors have reassured her that she should start. My grandaughter was teary eyed while thanking each of us for coming to the game. She does this every game! My daughter's team finished one of their leagues Saturday....3rd place for 7th and 8th grade. We celebrated at Taco Rock in the breeze. The closeness and friendship is lasting. Her team from last year...the 8th graders made JV this year. They still come to some of her practices. She coaches my 7th and 8th grade grand daughters. The grandaughters also play rec basketball. They played yesterday and my girls scored 12 points a piece. The 4th quarter the only set their teammates up for shots....to no avail. One girl hit one free throw. Final score 25-16. The girls had mainly 3 pointers. Bad night for GB against Tate. Only the boys JV team won. Great night for 4 tough games played. Varsity boys had their first loss of the season. They played fast and hard but could not get their shots to fall. Disappointing but still love watching this teams enthusiastic game play. The varsity girls lost. Proud of my granddaughter and her hard fought battle. Even with her rebounds, assists, and shots it didn’t happen. But watching her fight for the defensive position and breaking free of a double team to attempt shots was exciting. She gets stronger and stronger and she is taking a more of a leadership role to spark her team. Still waiting on the right combination of players to get the job done. Come on coach, you have the talent. Lost our 3 point shooter in the beginning of the 2nd quarter to a sprained ankle. On a positive note granddaughter said, the entire team loves the name / name family cheering section. Always at least 12 of us to whistle, cheer and keep the refs straight. It would have been a better night if Seaoat was there. I would love you to post a video of part of the game, but I am a bb nut. That's so cool. I bet she was thrilled about that. 26 Re: Varsity Game last night!